Eihei Peter Levitt began Zen practice in the late 1960’s, and is a lay Zen teacher in the Suzuki Roshi lineage. He maintained a solo practice until he became a student of Jakusho Kwong-roshi from 1983 to 2003. Thereafter, he received Entrustment from Zoketsu Norman Fischer. He is the author of ten books of poetry, including Within Within, One Hundred Butterflies, and Bright Root, Dark Root, and three of prose, including A Flock of Fools: Ancient Buddhist Tales of Wisdom and Laughter, which he co-translated and retold with Kazuaki Tanahashi, and Fingerpainting on the Moon: Writing and Creativity as a Path to Freedom. 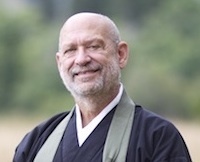 Peter also served as Associate Editor of Treasury of the True Dharma Eye: Zen Master Dogen’s Shobo Genzo, edited by Kazuaki Tanahashi, and he was the editor of Thich Nhat Hanh’s, The Heart of Understanding, and Jakusho Kwong’s No Beginning, No End: The Intimate Heart of Zen. In addition, he co-edited with Kazuaki Tanahashi The Essential Dogen: Writings of the Great Zen Master. Peter has also published fiction, and poetry translations from Spanish, Chinese and Japanese. Poet Robert Creeley wrote that Peter Levitt’s poetry “sounds the honor of our common dance,” and in 1989 Peter received the prestigious Lannan Foundation Award in Poetry. Originally from New York City, he now leads the Salt Spring Zen Circle on Salt Spring Island in British Columbia where he and his family reside.